I recently mentioned two breweries that need a good kick up the arse to get going. Here's an update on where they stand at the moment. In the US, we have Beara Irish Brew. Their kickstart page is here. So far, they have made $9,186 so well done to them. They are still looking for more of course, even if their kickstart page lists their goal as $9k, they really want to get as close to $30k as they can. 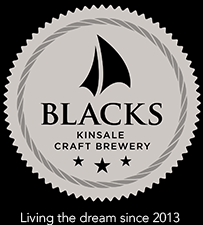 Closer to home is Blacks of Kinsale. Here's what I thought of their launch beer. They are currently brewing in the 8 degrees brewery but have their own brew kit on the way. They need help with funds to get their own brewery off the ground of course. Black's are looking for €5000 on their indiegogo crowd fund page. When I first mentioned it here, they had managed €345 and today that stands at €960. There is still 35 days to go to raise any and all money they can get. Can't decide on which to try? Get all three! Kinsale GOLD, Kinsale INK and Kinsale Black You also get the T-Shirt, Coasters and Beer Tankard perks (Don't forget the T-shirt gives you free brewery tours) so you can also visit to view your name which will be forever etched onto our recognition wall display in the brewery tasting room. I reckon this would make a great gift for someone's birthday or even Christmas. Perfect gift for the person who has everything. Remember, everything you give will result in your name going on the wall in the brewery tasting room. Good bragging rights if you are down with mates for a tour. Update: Just after writing this article, I launched an initiative on Beoir to raise €1000 for Black's. We reached our goal last night.